You might be asking yourself, “Why should I join the 5Box Challenge”? Here is a basic truth: YOU CAN MAKE A DIFFERENCE. If you haven’t heard of the 5Box Challenge, read What’s the 5Box Challenge?. At the same time you might be telling yourself, “I don’t have any extra money.” But the truth is the generosity of one individual, when combined with others, makes a difference. That’s where the 5Box Challenge comes in. You can work together with your friends and family to make a huge difference. My perspective on charities has changed since we began Spreading Sunshine. Now I rarely pass a fundraising organization without donating. Do I donate a lot of money? No. But some loose change, a few dollar bills can make a big difference. Before David was born, I lived in a bubble. I knew very few families affected by illness or disability. My life is different now; illness and disability are an everyday part of it. Not only does my son have Down syndrome and various health issues, but I serve an organization that focuses on ministering to families who are impacted by illness and disability. I see it all the time. My life experiences give me a strong desire to love and serve these families. The 5Box Challenge gives YOU an easy way TO MAKE A DIFFERENCE. With the help of friends and family, you can sponsor 5 Sunshine Boxes. These boxes will be shipped to children and families who are facing serious medical challenges. They will encourage, bring joy, and give hope. What’s stopping you? Go ahead, get involved! We need your help to reach our goal to raise funds to send 500 Sunshine Boxes. You can make a difference! CLICK TO JOIN THE 5BOX CHALLENGE . Final approval of our “Sunshine Box” which will be filled with toys, goodies and snacks to brighten a child’s day. The post You Can Make A Difference appeared first on Spreading Sunshine. This fall Spreading Sunshine invites you to take the 5Box Challenge. What’s the 5Box Challenge? It’s an opportunity for you to make a difference for families whose child faces serious medical challenges. Here’s how it works: You create a DIY fundraiser and work together with your friends and family to raise $250. Your efforts will fund five Sunshine Boxes (care packages) for children all over the country. We’re looking for students, business owners, moms and dads, church groups, and work teams who will join the 5Box Challenge. You can do this wherever you live. Our goal is to raise funds to send Sunshine Boxes to 500 children. We need your help to make this happen! 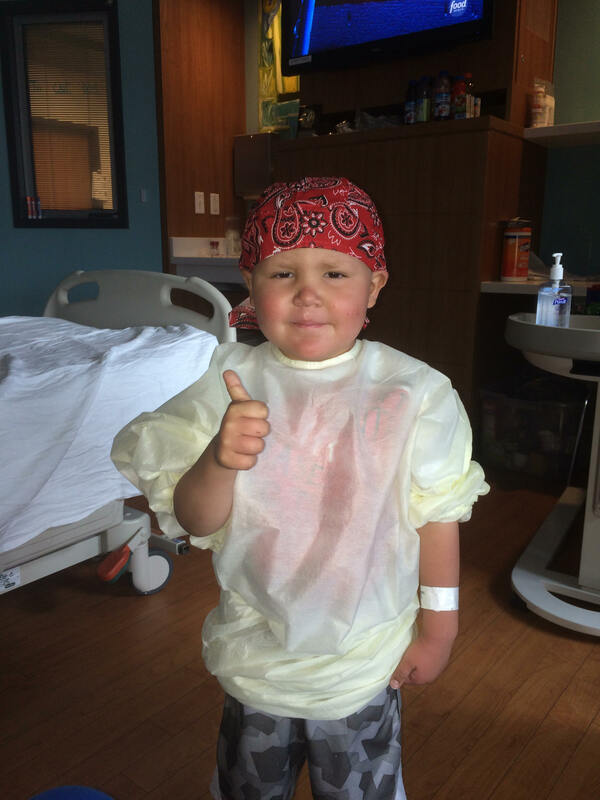 Recently, we sent a Sunshine Box to Aidan who has been diagnosed with Stage 4 Neuroblastoma. His mom, Elena, sent us adorable pictures of Aidan opening his Sunshine Box and shared what receiving a Sunshine Box meant to their family. “The name of this organization explains it all: Spreading Sunshine. The Sunshine Box … brought my son joy, a smile and excitement. It was amazing that a box could do all of that for him. We need your help to spread joy, love and happiness to children. Join the 5Box Challenge! The post What’s the 5Box Challenge? appeared first on Spreading Sunshine. In 2012, Sam was born with Cystic Fibrosis. We had many challenges with his care. But we never expected what would happen in November 2014. He was experiencing a persistent fever, unexplained bruising, mouth sores, and chronic fatigue. Thinking that he had something CF-related, we contacted our local pediatrician and requested blood work be done. On the Friday after Thanksgiving, we went to an almost empty hospital to have Sam’s blood drawn. Before I even made it back home, the doctor was calling me with results. He would only tell me that Sam’s white blood count was “extremely high” and that we needed to go straight to Children‘s of Alabama. Our hearts were in our stomachs as we made the two-and-a-half hour trip to Birmingham. I prayed and asked God to please not let this be an extended “tune-up.” This is what we call the hospital stays for CF patients who need antibiotics and a little extra therapy after an illness or infection. Honestly, I can’t remember anything he said over the next few minutes. I felt as if my heart was going to explode and my mind was racing. My husband and I just huddled around our sleeping two year old and wept as never before. Immediately, the staff whisked us away to the oncology floor. Sam was given medicines through an IV to try to rid his body of the poison that had accumulated in his blood. 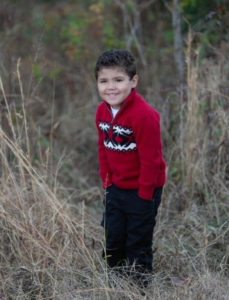 The next morning, he received his first dose of chemo, and his three-year journey with Acute Lymphoblastic Leukemia (ALL) began. Since that time, Sam has been hospitalized for more than 80 days, received more than 15 spinal injections of chemo, taken thousands of doses of medicines, received over 100 doses of chemotherapy, lost his beautiful curly hair, and has experienced more side effects than I can count. Through it all, he has shown bravery and courage beyond compare. God has strengthened him every step along the way and has carried Sam when his own little body couldn’t withstand any more. This monster called cancer has tried its best to destroy our child and our family along with him….but GOD. GOD has been so very good to us and has shown us His sovereign grace and mercy every single day. This has not been an easy road, but it is one that we would travel again if it be God’s will. He has taught our entire family so much about love, selfless giving, and grace. Our warrior is seven months away from the end of his treatment protocol. We see light at the end of the tunnel…..HIS light.